WASHINGTON (AP) — The nation's capital embraced George H.W. 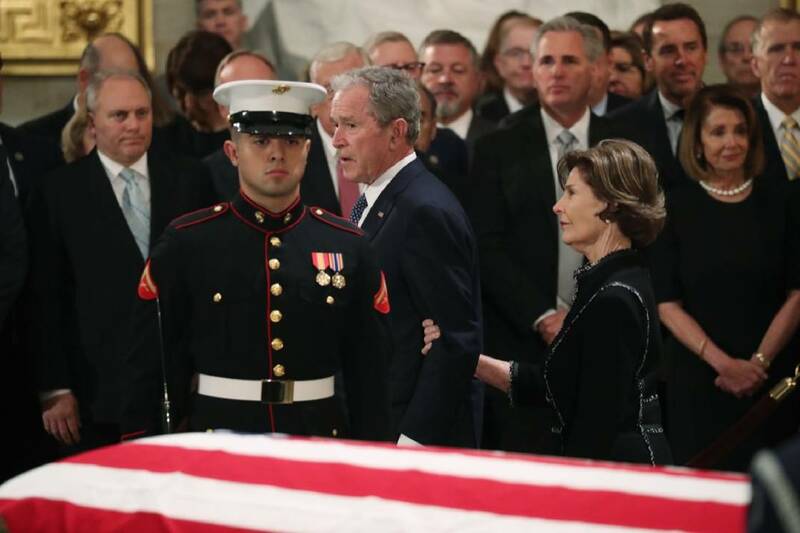 Bush in death Monday with solemn ceremony and high tributes to his service and decency, as the remains of the 41st president took their place in the Capitol rotunda for three days of mourning and praise by the political elite and everyday citizens alike. Sent off from Texas with a 21-gun salute, Bush's casket was carried to Joint Base Andrews outside the capital city aboard an aircraft that often serves as Air Force One and designated "Special Air Mission 41" in honor of Bush's place on the chronological list of presidents. His eldest son, former President George W. Bush, and others from the family traveled on the flight from Houston. Shortly before leaving the service, he married his 19-year-old sweetheart, Barbara Pierce, and forged the longest presidential marriage in U.S. history. Bush enrolled at Yale University after military service, becoming a scholar-athlete and captaining the baseball team to two College World Series before graduating Phi Beta Kappa after just 2 years.